Age and health are important factors in any treatment. The main purpose of the article has been to discuss the need for replacing missing teeth in the frail elderly. Neither reliable definitions of acceptable oral function nor the need for tooth replacement exist. Nevertheless, the dentist must relate to these concepts. «The Shortened Dental Arch Concept» shows that acceptable oral function in the elderly can still be obtained, even in severely reduced dentitions. Informed consent is only fulfilled when the elderly person is fully informed of all acceptable treatments. Optimal treatment can be impeded by a reduced ability to endure long-lasting, multiple appointments, motor diseases or financial limitations. Some simplified prosthetic treatments with reduced longevity can be justified; others are contraindicated because of tissue harm. Prosthodontics may also sometimes be justified for the elderly even if oral diseases are imperfectly controlled. Deciding whether to repair or renew prostheses is difficult, and must be assessed individually. Small fixed dental prostheses (bridges) are easy to produce, usually provide better oral function, may not cost more than partial removable dental prostheses, are preferred by the elderly and should never be excluded as an option. The need for replacing missing teeth in the elderly will persist, but should only be implemented after careful individual evaluations. The decision to replace missing teeth in the elderly is complicated because no scientific standards exist as to what constitutes acceptable oral function. It may be considered less professional to over-treat than under-treat replacement of missing teeth; reduced dentitions without anterior gaps may provide satisfactory function. The elderly's need to replace missing teeth can only be revealed if they are adequately informed of all acceptable treatment options and relevant factors involved. Simplified treatments may be acceptable on specific indications. Small fixed dental prostheses should never be written off as an option; compared with partial removable dental prostheses they have superior functional qualities and need not necessarily cost more. Why is it difficult to decide if missing teeth should be replaced? The main focus of this paper is to discuss the need for replacement of missing teeth in the elderly. The object of any dental treatment is to maintain or even improve oral function. When teeth are missing, prosthodontics restore oral functions such as masticating, speaking, appearance and oral comfort. What constitutes acceptable levels for these functions is rather poorly defined, and there are no well-founded criteria regarding the need to replace teeth. Also, oral function has lately been increasingly associated with oral health related quality of life (OHRQoL). The present task therefore poses a number of challenging questions. Some of these may seem simple and easily answered, but several uncertainties exist. Because of the lack of a generally accepted definition among professionals as to what constitutes an oral handicap, the objective need for tooth replacement is unclear both on a population and individual level. For that reason, the subjective need may be over- or under-estimated, resulting in inadequate or inappropriate treatment solutions. Tradition, culture, mentors' opinions, education, legal aspects in claim investigations about what is «generally accepted treatment standards» etc. have influenced clinicians and care planners more than we care to admit. What is the role and effect of public guidelines? Traditional «thinking" about prosthodontics and decision making still pervades official guidelines and regulations. A standard requirement for prosthetic rehabilitation is to establish an adequate oral function including mastication, speech and aesthetics. The Norwegian Health Authority (1) has published some guidelines regarding the replacement of missing teeth in which it is stated: «individual evaluations must be made about acceptable masticatory function and what is necessary for the individual to be able to communicate and have social relationships without hindrances that relate to teeth. Furthermore, the term «aesthetic zone» relates to teeth that the individual patient (our highlighting) considers necessary to be able to have normal social interaction without problems relating to teeth». A comparable Swedish text from a regional guideline about refundable treatments for those in need of what is termed necessary dental treatment states that «the assessment implies that conservative and prosthetic treatments significantly increase the patient´s ability to eat and speak and provide a substantially elevated quality of life and well-being (our highlighting)» (2). Even if the public frame regulations like the above are only general guidelines, they still significantly influence decisions in clinical dentistry and add stress to both dentist and patient, with very low reliability. A Norwegian professor in gerodontology states: «Given the same dental condition, different patients may receive anything from no to quite extensive treatment. In an ailing 80-year-old with a reduced dentition, temporary fillings, temporary rebasing or just oral care can be a good treatment» (3). A Swedish associate professor within the same field emphasizes in an interview that «When the public dental service treats elderly, many follow the same standards as for a «normal adult», but much can be different in the elderly». She also points out the unclear knowledge and diagnostics that exist about how many teeth that are needed for oral function and chewing (4). How many teeth do the elderly need for a satisfactory oral function? The introduction by Käyser (5) in the 1970-ies of «The Shortened Dental Arch Concept» (SDA), known by many clinicians as the premolar-occlusion, represented a paradigm shift in prosthodontics. It was emphasised that «treatment goals can be limited and still satisfy patients' demand by using a problem-solving approach». This was contrary to the traditional philosophy in which a theoretical complete ideal dentition was pursued. It took many years before SDA reached its present near universal acceptance. Despite this, the SDA concept is still not widely practised (6,7). The SDA, considered to be relevant for patients aged 40 - 80, provides in general terms a suboptimal but acceptable functionality. Käyser also suggested the Extremely Shortened Dental Arch Concept (ESDA), for patients 70 - 100 years of age, which provides a minimal but still individually acceptable functional level. As a consequence of the SDA and ESDA treatment philosophies, it may currently be considered less professional to over-treat than under-treat when replacing missing teeth; especially in older patients who are often not cognisant of their real needs. What is meant by «elderly» and what is our target group? "Elderly» is an elusive concept. Most dentists would consider a healthy, fit and active person aged 80 or over as any other patient and provide the generally used treatment option for adults. What happens in the future if conditions suddenly change, as is not unusual in this age group? Space does not allow a full discussion of all possible aspects of replacement of missing teeth and necessary maintenance in the heterogeneous «elderly» group. Our main focus will therefore be on frail elderly who are usually treated by general practitioners, as opposed to institutionalised patients who may require more specialised care. We will present some questions that we hope could be usefully discussed among care givers and care planners. Although we may not be able to give complete answers, we hope that the questions themselves and the ensuing discussion will contribute as eye openers. Understanding what constitutes necessary and reasonable treatment in a clinical situation is essential and requires a very high level of knowledge, empathy and patient centred respect. No simple and reliable test exists, even though aspects related to OHRQoL have been subject to increasing research during the last decade. The application of evidence based dentistry, a very popular guideline nowadays, seems to be of little or no use in such basic, but also complex diagnostics. How can the elderly's real need to restore missing teeth be uncovered? The following aspects are usually relevant and ought to be considered: Patients can hardly be expected to express their real need and how it may be satisfied without a full understanding of possible treatment options. These are determined by the dentist after a thorough clinical examination. In the subsequent dialogue between patient and dentist, these options, with relevant advantages, disadvantages, financial consequences, risks and prognoses need to be discussed and explained. However, the dialogue should be no more extensive or complicated than necessary for its purpose. It must be taken into account that many elderly regard the dentist as an authority figure, whose concept of optimal prosthodontic treatment based on the dentist's superior knowledge and experience may be difficult to challenge. However, usually several treatments are possible, and it is important that the dentist's preference is not presented so strongly that the patient's subjective need becomes obfuscated. Relevant to this discussion is the clinical experience that the subjective needs of the elderly may be less demanding than those of younger patients, and deviate significantly from more «objective» optimal treatments suggested by the dentist. In contrast, a few patients may insist on restorations that are not in accordance with generally accepted standards. In the latter case, even if the patient is adamant, the advice is to refrain from treatment, because the dentist carries the responsibility for any treatment provided. Only after deliberations like those mentioned above, is the patient able to give «informed consent» to the chosen treatment as specified by law and ethics. Informed consent by frail elderly persons may be complicated by declining mental ability. Tiredness or early dementia may cause communication problems that may be reduced with the assistance of a family member or an emphatic friend. If dentist and patient have had a long-standing professional contact the decision-making is greatly simplified. What may be obstacles to optimal treatment of elderly? Of particular prosthodontic interest in this respect is the reduced ability by some elderly to endure long-lasting and multiple appointments - particularly associated with complex treatments. The lack of endurance may be related to general failing health and somatic diseases, but also to reduced mental stamina or other psychosocial circumstances. Even when this problem does not apply, conditions like shaking or rigidity or reduced muscular function in patients with motor symptoms or conditions that preclude prolonged periods of sitting still in a dental chair, may denote insurmountable obstacles for complex treatments. Lack of funding may also prevent preferred treatment. Although all Nordic countries have some degree of public funding for dental treatment, the systems and traditions differ significantly (8,9). Thus, prosthodontic treatment is to a significant extent publicly reimbursed in Sweden. In Norway, with few exceptions, only two-implant retained overdentures are fully reimbursed. In Denmark and Finland, also with a few exceptions, no such treatment is reimbursed. The elderly use dental services less than younger adults even though their treatment needs are more complex (10). Furthermore, the cost of prosthodontic treatment and the level of public funding may influence the use of oral health care services for elderly (11), the choice of prosthetic treatment (12) and OHRQoL (13). When are simplified methods and materials justifiable in the elderly? There are numerous types of simplified methods and materials that may be indicated for elderly in specific situations. Examples are composite crowns, (as opposed to conventional crowns), fibre reinforced fixed dental prostheses (FDPs) also called bridges (as opposed to conventional FDPs) or resin bonded metal (usually chromium cobalt) FDPs. Their advantages are that they can be accomplished in shorter and fewer appointments compared with conventional methods. Composite crowns may perhaps not last as long as conventional crowns, but are still acceptable in suitable cases. Fibre reinforced FDPs are shown to have reasonable longevity as demonstrated in multicentre studies (14,15), and in suitable cases are certainly preferable to partial removable denture prostheses (PRDPs). Resin bonded metal FDPs with prepared mechanical retention have longevity comparable to conventional FDPs (16). Simple acrylic PRDPs with wrought wire retentive clasps (as opposed to PRDPs with metal framework) are always contra-indicated, except as temporary restorations, because of convincing documentation that long-term use causes irreversible harm to oral tissues, reduced function and poorer prognosis of the dentition. Patients with problems like those described above may be particularly suited for simplified methods and materials. Regrettably, unacceptable restorations like acrylic PRDPs are too often used indiscriminately in the elderly because they are inexpensive, expedient and may seem to satisfy short-term needs. Considering the dire consequences on oral tissues and loss of OHRQoL, in some cases such dentures may even be more expensive than alternative treatments. Furthermore, the use of ESDAs may sometimes be the best treatment for the target group if it satisfies the limited subjective need of the patient. Even if it does not, nothing is ever lost by employing ESDA. Thereby time is gained and an extension of the dental arch by whatever means can always be implemented later if indicated. What about prosthodontic treatment when oral diseases cannot be completely controlled? Infected teeth or retained roots and other conditions that cause pain and acute infection, must always be resolved before prosthodontic treatment. However, elderly may also have an increased risk of root caries, periodontitis, stomatitis or implantitis that can be quite resistant to treatment. These conditions may be successfully treated in the short term and prophylactic measures implemented. Still, in this age group they often relapse, due to factors like hyposalivation, reduced host resistance and sometimes inability and reluctance of the elderly to carry out adequate oral hygiene regimen. The ideal is that oral tissues should be free from disease before restorative treatments are undertaken. If this is not achieved, a significant proportion of this group will not be able to enjoy the benefits of restorations, with corresponding loss of OHRQoL. Compromising this ideal should never be made lightly, but must be justified after careful consideration of each individual. Examples of the dilemmas such problems pose in regard to prosthodontics are apical pathology with few or no subjective symptoms, slowly developing periodontitis or treatment resistant stomatitis. A necessary condition for undertaking prosthodontics is then that possible harmful consequences are considered to take too long to be of major importance compared with the advantages gained. In all such cases a professional maintenance regimen needs to be implemented. This must be individualized and controlled so that failure of the patient to attend is recognized. Then the patient should be routinely, and if necessary repeatedly, contacted. If unsuccessful, contact with family members may be attempted. If the above measures are not implemented, the short-term benefits in the frail elderly may rapidly be offset by adverse effects. Whether or not to undertake prosthodontic treatments under these conditions pose difficult ethical and professional dilemmas for the dentist. How can the need for repairs of fixed restorations be minimised? In the reduced dentitions in SDA or ESDA the biting and chewing forces load fewer teeth than in dentitions with more teeth. The resulting heavy loading on remaining teeth and abutments necessitates adequate dimensioning of the metal constructions. Also, strong retention needs to be carefully considered. Night guards may counteract some of the problems. The increased risk of root fracture of endodontically treated abutments with posts and cores is reduced by furnishing such teeth with solid ferrules embracing the root. Endodontic treatment through a crown is sometimes necessary, but this procedure reduces the strength of the dentin preparation with resulting high risk of loss of retention or fracture of tooth substance. Minimal entrance to pulpal chamber and root canal should be sought in order to reduce these risks. Preparation for and insertion of a post in such cases, which may be considered after root canal treatment, in fact further reduces the mechanical strength of the tooth. Repair or renewal of existing prostheses? Maintenance of existing restorations in the elderly may be equally and sometimes even more important for preserving oral function than constructing new ones. To this end, the need for regular, systematic recalls and implementing measures when needed cannot be stressed enough. This is particularly important in regard to PRDPs due to their potential for tissue harm. When problems do occur, deciding whether to repair, adjust, renew or leave well alone is difficult. Adapting to new prostheses may be problematic for an elderly person, particularly if the intervention alters the denture's external shape. However, some interventions are less risky than others: repairing fractured retention clasp arms of a PRDP, fractured denture teeth, fractured acrylic base if the fragments can be accurately positioned or extending the denture when a natural tooth is lost, certainly fall within this category. Fractures of an acrylic denture base caused by material fatigue - typically in the midline of CRDPs, should not be repaired because such defects inevitably recur. Rather, a rebasing or a new denture is the treatment of choice. Relines of PRDPs or complete removable dental prostheses (CRDPs) may extend the lifetime of the dentures. With PRDPs, relines should only be attempted if the general fit of the metal framework is acceptable and all metal components are functioning. Relining CRDPs serves no purpose unless aesthetics and occlusion are acceptable. Unfortunately, patients must manage without removable dentures during laboratory assisted repairs, although the time needed to carry them out may be reduced by careful preplanning. If the alternative to repair is making a new denture, the patient has to decide whether this disadvantage is worth the cost and possible adaptation problems incurred in receiving a new one. If an existing denture must be remade, it may be an advantage to make use of the duplicate denture technique in which internal and external surfaces of the existing denture are replicated (16), which is then used as a basis when constructing a new one. This method hopefully reduces the risk of rejection. Also the original denture is intact and can be reinserted if the patient cannot adapt to the new one. Mechanical breakdowns of FDPs are rare. A possible exception is broken facings, which can mostly be polished or repaired with composites. The most common causes of failure of fixed constructions are root caries or periodontal breakdowns of the abutments. Consequently, prophylactic measures are of crucial importance for maintaining FDPs in function. If the abutments have fractured or the retention of the FDP is lost on one or more abutments, repairs are usually technically very complicated, impractical or impossible to perform. Then, a new appliance has to be fabricated or the existing one shortened. As intimated earlier, in guidelines for public funding, including those that exist in Nordic countries, FDPs are still, implicitly or explicitly considered an exclusive, expensive and «unnecessary» treatment. The preferred alternative, no doubt mainly for economic reasons, is PRDPs. This preference is also shared by many colleagues and health care planners who claim that FDPs are more expensive, technically challenging and difficult to keep clean. (4, 18). However, compared with FDPs, PRDPs substantially add a risk of mechanical damage to gingival tissues, plaque retention and dental caries (Fig. 1) (19,20). It has also been reported that up to 40 % of PRDPs are rejected by the patients soon after insertion, indicating a low patient acceptance and reduced OHRQoL of such constructions (21). Furthermore, it has recently been shown that patients prefer to have missing teeth restored by FDPs» (22). Fig. 1. The use of PRDPs is associated with increased plaque accumulation and caries risk as seen in this patient. Establishing and maintaining optimal oral hygiene through a systematic regimen of recalls and supportive therapy must be implemented. If the SDA and ESDA concepts are followed, gaps in the anterior dentition are often small. These are more adequately closed with FDPs, which are mostly easy to produce, carry a minimal risk of harmful consequences and are better accepted than PRDPs. An implant supported crown may also suffice to close the gap. In suitable cases the use of a simple two-unit cantilever FDPs (one abutment/one pontic) can be justified (Fig. 2), even when used to extend the dental arch posteriorly, as documented in prosthetic literature (19,20,23). A similar distal extension can also be accomplished with an implant supported crown. Such treatment may be especially valuable for the elderly who have retained natural teeth to a high age and who may experience great problems adapting to a PRDP with a resulting reduced OHRQoL. Furthermore, keeping in mind the SDA and ESDA concepts, the laboratory cost and clinical time required in order to restore such a dentition by means of an FDP may sometimes be equal to or lower than a high quality PRDP counterpart (Table 1), which requires much time for construction, clinical adjustments and follow-up (Fig. 3) (24). This was demonstrated in a recent Irish study (25) where laboratory costs were 38 % higher for the PRDP than the FDP. Also, initial clinical visits, follow-up appointments and total clinical time were on average 48 % higher for the PRDP group. True, the FDP patients had an average of just 2.6 replaced in order to satisfy the SDA requirement whereas the PRDP replaced 6.3 teeth. However, the added teeth of the PRDPs were a consequence of the construction, had little therapeutic value and did not enhance the OHRQoL as demonstrated in a large multicentre study (26). Fig. 3. A-D. A, B: Patient 66 years old. Has had maxillary CRDP and mandibular PRDP for many years. Present dentures one-year-old. Maxillary denture keeps falling down; mandibular PRDP hurts. Gingival trauma because the construction is too close to soft tissues. C, D: Patient 91 years old. Mandibular PRDP 15 years old. 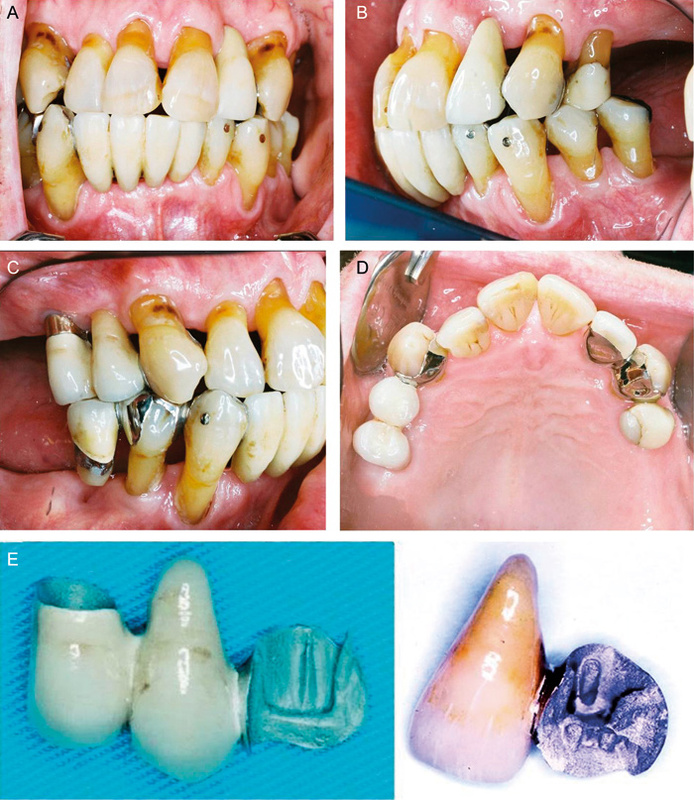 No gingival trauma, no relining/ rebasing during these years. Denture still stable and functional until patient died aged 96. Table 1. A comparison of treatment costs between a cobalt-chromium PRDP and two small FDPs. Laboratory costs calculated by a Swedish dental laboratory. The PRDP is constructed according to a «hygienic» regimen (21) with a metal palatal plate, two metal backings, two pontics and two gold wire claps. The three-unit resin-bonded FDP includes one full metal-ceramic crown and one partial crown; the two-unit FDP includes one resin-bonded partial crown (Fig 2). Based on the above, it can be argued that the current preference for PRDPs, has resulted in a longstanding overproduction of such appliances. The reduced risk for tissue injuries, less demanding long term maintenance, patients´ preference and improved OHRQoL, strongly suggest a more liberal use of FDPs - particularly when restoring minor gaps in the anterior region. The type of crown for retaining a fixed restoration is in this context of lesser importance. A complex or unsatisfactory prosthetic treatment may be changed to a simple and effective one by the use of implants. The construction will then be technically safer, have better oral function and may easily improve OHRQoL in an elderly patient. One cost-effective example for patients unsatisfied with their mandibular complete denture is the insertion of two implants with ball attachments retaining an overdenture (27). Age as such does not affect implant survival (28,29). However, there may be surgical, medical, psychological and financial aspects that limit the use of implants, particularly in frail patients. Even though the rate of edentulousness at present varies between the Nordic countries, epidemiologic data suggest that the proportion of edentulous elderly in the population will decrease in the coming years. A substantial number of elderly will still, for various reasons, have missing teeth, also in the anterior region, and be in need of tooth replacements. Furthermore, a large number of patients needing prosthetic treatment will be in the older age groups and many of these will have general diseases and use multiple medications. This may influence choice and implementation of prosthetic treatment and will require increased knowledge and understanding by clinicians. Research and teaching need to change rapidly to meet these requirements. Berg E, Isidor F, Öwall B.
Hovedformålet med artikkelen er å diskutere behovet for å erstatte tapte tenner hos skrøpelige eldre. Beklageligvis finnes verken reliable definisjoner av tilfredsstillende oral funksjon for eldre eller behovet for tannerstatning. Likevel forventes at tannleger skal forholde seg til begrepene. «The Shortened Dental Arch Concept» viser imidlertid at akseptabel oral funksjon for eldre kan oppnås i betydelig reduserte tannsett. Krav til informert samtykke kan kun oppfylles når den eldre er informert om alle akseptable behandlinger og relevante forhold. Optimal behandling av pasientgruppen vanskeliggjøres ved redusert evne til å tåle langvarig og frekvent behandling, motoriske sykdommer med spasmer eller skjelving eller økonomiske begrensninger. På begrunnede indikasjoner kan forenklede behandlingsmetoder, vanligvis kontraindikerte på grunn av skadevirkninger eller kort levetid, likevel benyttes på eldre. Tilsvarende kan det utføres protetikk også der optimal forbehandling av orale sykdomstilstander ikke lykkes. Små broer er enkle å utføre, kan ofte gi bedre oral funksjon, koster ikke nødvendigvis mer enn partialproteser, foretrekkes av eldre og bør derfor aldri utelukkes som behandlingsalternativ. Om det skal utføres reparasjon eller fornyelse av proteser, er ofte vanskelig å avgjøre. Det vil også i fremtiden være behov for tannerstatninger blant eldre. Individuell vurdering er særlig viktig ved behandling av denne gruppen. Helsedirektoratet. God klinisk praksis i tannhelsetjenesten. En veileder i bruk av faglig skjønn ved nødvendig tannbehandling. Helsedirektoratet. 2011: IS-1589: 8. Enheten for tandvårdsstyrning. Region Skåne Tandvårdsstöd Regelverk Tandvårdsreform. 1999/2013.2015: 9. Strand GV. Tenner for hele livet. Nor Tannlegeforen Tid. 2011; 121: 104 - 9. Suslick J. Interview med Inger Wårdh. Tandläkartidningen. 2015; 107: 52 - 3. Käyser AF. Teeth, tooth loss and prosthetic appliances. In: Öwall B, Käyser AF, Carlsson GE. Prosthodontics. Principles and management strategies, eds. London: Mosby-Wolfe, 1996; 37 - 45. Kanno T, Carlsson GE. A review of the shortened dental arch concept focusing on the work by the Käyser/Nijmegen group. J Oral Rehabil. 2006; 33: 850 - 62. Korduner EK, Söderfeldt B, Collin-Bagewitz I et al. The shortened dental arch concept from the perspective of Swedish general dental practitioners: a qualitative study. Swed Dent J. 2016; 40: 1 - 11. Palmqvist S, Söderfeldt B, Vigild M. Influence of dental care systems on dental status. A comparison between two countries with different systems but similar living standards. Community Dent Health. 2001; 18: 16 - 9. Holt C. Brugen af og betaling for tandpleje i Danmark, Sverige og Norge. Nor Tannlegeforen Tid. 2013; 123: 12 - 8. Widström E, Augustdottir H, Byrkjeflot LI et al. Systems for provision of oral health care in the Nordic countries. Tandlægebladet. 2015; 119: 702 - 11. Raittio E, Kiiskinen U, Helminen S et al. Dental attendance among adult Finns after a major oral health care reform. Community Dent Oral Epidemiol. 2014; 42: 591 - 602. Pillai RS, Mathur VP, Jain V et al. Association between dental prosthesis need, nutritional status and quality of life of elderly subjects. Qual Life Res. 2015; 24: 2863 - 71. Raittio E, Lahti S, Kiiskinen U et al. Inequality in oral health-related quality of life before and after a major subsidization reform. Eur J Oral Sci. 2015; 123: 267 - 75.
van Heumen CC, van Dijken JW, Tanner J et al. Five-year survival of 3-unit fiber-reinforced composite fixed partial dentures in the anterior area. Dent Mater. 2009; 25: 820 - 7.
van Heuman CC, Tanner J, van Dijken JW et al. Five-year survival of 3-unit fiber-reinforced composite fixed partial dentures in the posterior area. Dent Mater. 2010; 26: 954 - 60. Mahl D, Marinello CP, Sendi P. Markov models in dentistry: application to resin-bonded bridges and review of the literature. Expert Rev Pharmacoecon Outcomes Res. 2012; 12: 623 - 9. Lindquist TJ, Ettinger RL. Patient management and decision making in the complete denture fabrication using a duplicate denture: a clinical report. J Prosthet Dent. 1999; 82: 499 - 503. Lantto A. Tema äldretandvård. Method. Tandläkartidningen. 2015; 107: 20 - 21. Budtz-Jørgensen E, Isidor F. A 5-year longitudinal study of cantilevered fixed partial dentures compared with removable partial dentures in a geriatric population. J Prosthet Dent. 1990; 64: 42 - 7. Jepson NJ, Moynihan PJ, Kelly PJ et al. 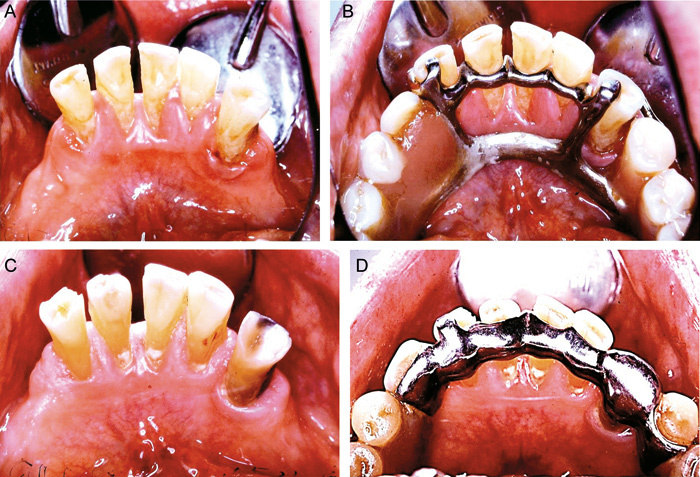 Caries incidence following restoration of shortened lower dental arches in a randomized controlled trial. Br Dent J. 2001; 191: 140 - 4. Riber E, Öwall B. Patienters anvendelse af fremstillede delproteser. Tandlægebladet. 1998; 102: 936 - 940. Cronin M, Meaney S, Jepson NJ et al. A qualitative study of trends in patient preferences for the management of the partially dentate state. Gerodontology. 2009; 26: 137 - 42. Jepson NJ, Allen PF. Short and sticky options in the treatment of the partially dentate patient. Br Dent J. 1999; 187: 646 - 52. Öwall B, Budtz-Jørgensen E, Davenport J et al. 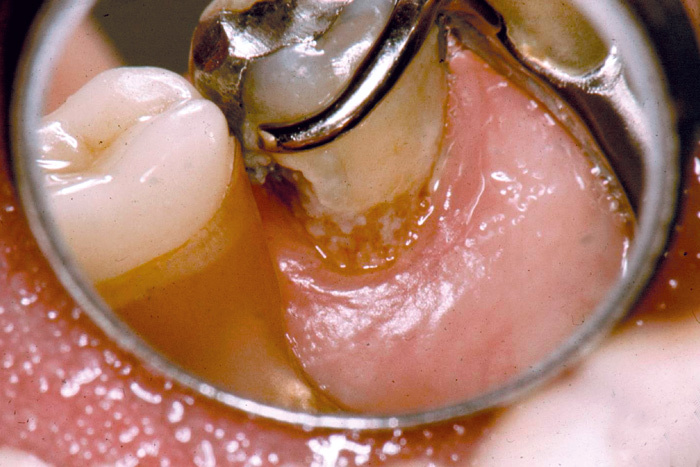 Removable partial denture design: A need to focus on hygienic principles? Int J Prosthodont. 2002; 15: 371 - 8. McKenna G, Allen PF, Woods N et al. Preliminary report of the cost-effectiveness of tooth replacement strategies for partially dentate elders. Gerodontology. 2013; 30: 207 - 13. Wolfart S, Müller F, Gerß J et al. The randomized shortened dental arch study: oral health-related quality of life. Clin Oral Investig. 2014; 18: 525 - 33. Gjengedal H, Berg E, Grønningsæter AG et al. The influence of relining or implant retaining existing mandibular dentures on health-related quality of life: a 2-year randomized study of dissatisfied edentulous patients. Int J Prosthodont. 2013; 26: 68 - 78. Park JC, Baek WS, Choi SH et al. Long-term outcomes of dental implants placed in elderly patients: a retrospective clinical and radiographic analysis. Clin Oral Implants Res. 2016. doi: 10.1111/clr.12780. Heydecke G, Boudrias P, Awad MA et al. Within-subject comparisons of maxillary fixed and removable implant prostheses: Patient satisfaction and choice of prosthesis. Clinical Oral Implants Research. 2003; 14: 125 - 30. Corresponding author: Einar Berg, einar.berg@odont.uib.no. Berg E, Isidor F, Öwall B. Prosthodontics for the elderly patient. Nor Tannlegeforen Tid. 2017; 127: 120-6.